Each year the Walk of Fame selection committee compiles a comprehensive ballot of qualified candidates with the help of cooperating surf associations, museums, magazines, and other media organizations. The ballot is broken down into five categories of achievement, are then distributed to an international panel of surfing authorities numbering 200, who cast their votes to decide which candidates will receive the coveted stones. COMING SOON, SWOF 25TH ANNIVERSARY BOOK! 1994 to 2018 BIOGRAPHIES & PHOTOS We are proud to offer a collectible hard bound book showcasing the inductees of the Surﬁng Walk of Fame. This rich cultural and historical book will be a great addition to your surf library. Books can be purchased for $29.95 each. Please check back for further details! 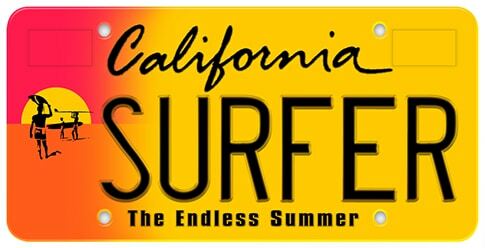 When the application process is complied with and underway, the Department of Motor Vehicles (DMV) will begin issuing ‘The Endless Summer’ license plates upon completion of the requisite ‘pre-sell’ – receipt of 7,500 pre-paid applications. At this time, we are taking information for those interested in supporting this effort. As soon as the application is in and the pre-sell commences, you will be immediately notified.